With Strictly back on our TV’s every weekend, Christmas seems closer than ever before! Yes, I know there are still 14 Mondays till Father Christmas comes down our chimneys, we stuff ourselves silly with roast dinner and surround ourselves with cardboard boxes and wrapping paper. But I can’t help getting a little ahead of myself, I’ve always found it much more cost efficient to spread the cost of present buying from September- November to give myself more of a buffer pay check wise going into the new year (pro tip – hit up black Friday for the real bargain presents). So, while our thoughts turn to Halloween and bonfire night and ultimately Christmas you might be stuck on what to give the travel lover in your life. 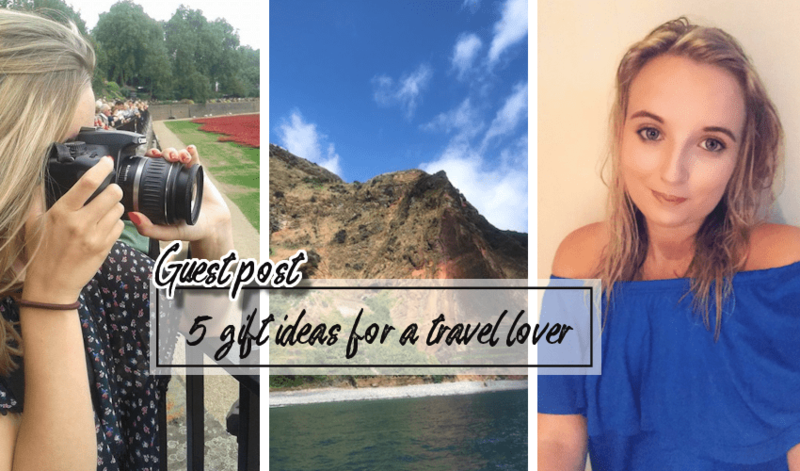 Whether you are looking for a birthday or Christmas gift or just want to treat yourself be sure to take a look at my five gifts for travel lovers. I’m sure you’ve seen the travel scratch maps, they seem to be everywhere, but I especially love this journal. Alongside the interactive maps that you can use to scratch off where you’ve travelled, this book is a planner, diary and translator with space to store those precious travel mementos. This would make for a cute stocking filler or a small gift for the travel lover in your life. This is a controversial one as I know many people are very anti Kindles and much prefer old fashioned books. Believe me for years I was the same but now I wouldn’t go on holiday without one. You could even buy a cute travel themed cover for the Kindle before giving it as a gift, and frankly you are giving the gift of reading which is in my opinion priceless. With a kindle you can download thousands of books, so you are never far away from your next adventure and its so light weight you can even carry it around while you go sightseeing. No travel lover is complete without a GoPro, I personally have a GoPro Hero 5 Session which is great because it’s so small, practical and waterproof! I love the fact I don’t need to worry about a waterproof casing. You can buy numerous amounts of mounts for it as well so it’s great for travellers wishing to record sports, road trips or holiday memories. If your loved one is looking for something with higher quality,there are other specs of GoPro you can check out, but they do come with a steeper price range. Studies show that colouring in is great for reducing stress and anxiety and boosting positive endorphins. This beautiful book is a collection of iconic sights from across the world and you could colour them however you fancy, utter free rein of creativity! Everyone has a travel wish list and this book could be a lovely way to remember that, plus it’s the ideal way to fill time whilst you wait for flight connections or public transport. 5. A5 Travel to do list: World, £6, Kikki K.
If you or the travel lover in your life is anything like me – super organised, then this to do list is perfect. It splits essential packing items into sections and there is space to add your own suggestions as well. Forgetting things on holiday or weekends away will be a thing of the past with these great lists. Ticking things off as you put them in your suitcase is super satisfying. I hope this gives you some inspiration for gift ideas for the travel lover in your life or even some tips for something you can treat yourself to! I blog all about travel, food and lifestyle over at Elle Goes Global with posts ranging from tips on budget travel to recipe ideas and spa visits. So, head over, subscribe and follow my adventures! My Instagram feed might give you travel envy but pop over and say hi I’d love to hear your thoughts. Thank you to Victoria for asking me to write a guest blog post for her, I understand I am the first guest blogger she’s ever had, and I feel very honoured. You can find Elle at her blog Elle Goes Global, Instagram: @ellegoesglobal and Twitter: @ellegoesglobal. These are all great gift ideas. I don’t travel, but even I would want some of these gifts just because they are something I could see myself regularly using them. The travel journal you mentioned sounds perfect! I have a scratch map hanging up just to my right, but being a stationary nerd, I loooove anything having to do with journals. Going to have to check that out! These are great ideas. I love the scratch travel journal and the colouring book! Definitely adding them to my Amazon wishlist.